Learn about the Lorex 2 Camera HD Home Security System with Long Range Night Vision for business surveillance. Includes features, pricing, and FAQs. The Lorex 2 Camera HD Home Security System with Long Range Night Vision is a security camera system for home and business surveillance. 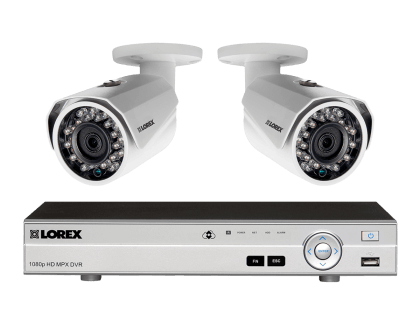 This Lorex security camera system features two weatherproof HD 1080P cameras and a 4-channel DV700 HD DVR. 2 HD 1080p security cameras. Pros: Easy to install, high-quality video, SmartIR technology for clear night vision. Cons: Customer service is slow according to some customer reviews. Bottomline: The Lorex 2 Camera HD Home Security System boasts a simple plug-and-play set up, excellent image quality and night vision. What are some alternatives to the Lorex 2 Camera HD Home Security System with Long Range Night Vision? Where can I buy the Lorex 2 Camera HD Home Security System with Long Range Night Vision security camera system? The Lorex 2 Camera HD Home Security System with Long Range Night Vision is available via Amazon and the Lorex website. Does the Lorex 2 Camera HD Home Security System with Long Range Night Vision work at night? Yes. The Lorex 2 Camera HD Home Security System with Long Range Night Vision allows you to see up to 150 ft. in ambient lighting and 100 ft. in total darkness. It features SmartIR technology, which aids with close-up recognition of objects, and ClearNight imaging for superior low-light operation. Can the Lorex 2 Camera HD Home Security System with Long Range Night Vision be used in any weather? Yes, the Lorex 2 Camera HD Home Security System with Long Range Night Vision is IP66 weather-proof rated, enabling it to operate in temperature between -22°F and 140°F.